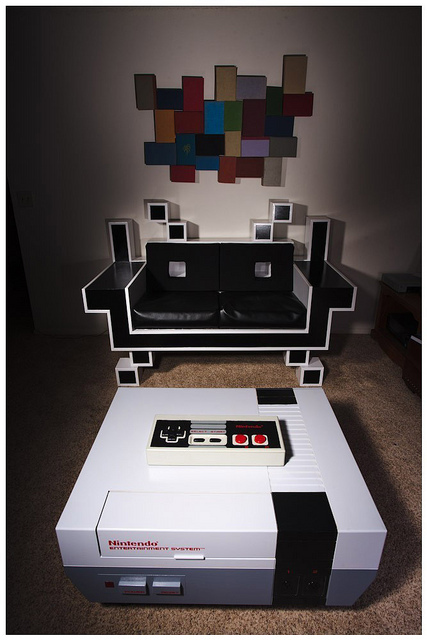 I saw the above image and was like “Hey cool space invaders chair” then I was like “NES TABLE!!!!! !1111 one one one one”. This is awesome, I want one, there is an entire gallery of images of the table over on Matt’s Flickr. The Cartridge slot opens to reveal an extra large fully functional NES controller. I think he has it wired up with his cable box inside, the controller ports are actually power sockets so he can plug in his laptop and the back opens up so he can reach the back of his cable box and whatever other gizmos he has in there. This is a series of posters by Laura C. Corbilla which revolve around the theme of well known video games to promote DrinkAware.co.uk I like the idea but to be honest they look a little too clean to me. I’m no graphic designer but in order to evoke the true spirit (I’m sorry…) of the subject matter the images should have been pixel art rather than vector graphics.